Our best customers are often those which first searched around - which often gets them nearly confrontational with us. They are baffled that ScanMyPhotos.com can charge as low as 3.5-cents to scan their photos. We've been here the longest - since 1990 and pioneered a new industry. Families around the country and overseas now conveniently order prepaid photo boxes, which includes all shipping. Each ScanMyPhotos.com prepaid box holds many more than 1,600 4x6" sized pictures. 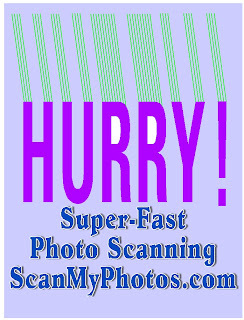 Or, they can use our Option # 2 service where they choose exactly how they would like their orders processed and pay just $64.00 to scan up to 1,000 pictures. For the prepaid boxes, they can buy two boxes and get the third box free; that about 6,000 pictures sca nned for just $299.90, including all free shipping and same day service!. Why do people using our 24/7 Live Support and calling our ScanMyPhotos.com headquarters [949-474-7654] get so incensed? They are amazed that we are making it so easy and affordable. We are doing it their way and fast. The service we pioneered and commercialized is super-fast. All orders are scanned and mailed back the same day. encrypticly secured online ordering system. All orders are processed and mailed out the same business day when ordered before 2:00 pm (PT).